Grace Moore (1898 -1947), an American soprano born in Tennessee, began her career in the choir of the local church and progressed to the stage of the Metropolitan Opera Company. 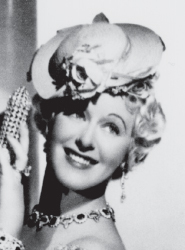 She was a star of stage, screen, radio, and recordings. The Grace Moore Scholarship is for professional studies in the Bachelor of Music degree program in voice. The award includes a scholarship towards four years of study at the University of Tennessee and voice lessons with our professional artist faculty. Additional applied music scholarships in voice may be awarded to finalists whom the judges feel are worthy of special recognition. To be eligible for a Grace Moore Vocal Scholarship, you must be a resident of or born in the State of Tennessee and have graduated from high school between within the last five years. Deadline for Application: at least one week before the audition date you select. Preliminary auditions will be held during regularly scheduled School of Music Auditions as identified on the auditions page of the School of Music website. Finals will be held on the date noted on the auditions page. The contestants will present two selections (from memory) from the list below. You may perform two selections from the same category if you wish. Note about accompaniment: An accompanist will be provided for both the preliminary and final round auditions. If you wish, you may bring your own accompanist. Please note that recorded accompaniments (CD's, and MP3's) are prohibited. The recipient of the Grace Moore Scholarship must enroll as a full-time student with a major in vocal performance in the School of Music at The University of Tennessee. The School of Music requires that all scholarship students maintain at least a 2.75 grade point average. The voice faculty shall serve as judges for the auditions. If, in the opinion of the judges, no contestant is found worthy, the scholarship will not be awarded.